A special facial cream that ensures an excellent global protection: broad-spectrum UVA/UVB, anti-aging and cellular DNA. Anti-aging facial SPF 30 suncare for clear or dark skins allying safety and pleasure. Its penetrating texture offers the skin a transparent matte and not sticky finish. Apply the Serum Vinoperfect before habitual sunscreen to prevent stains and display a uniform and lasting tan. Before any sun exposure, apply generously and evenly over the face. Repeat often the implementation to ensure the best protection. 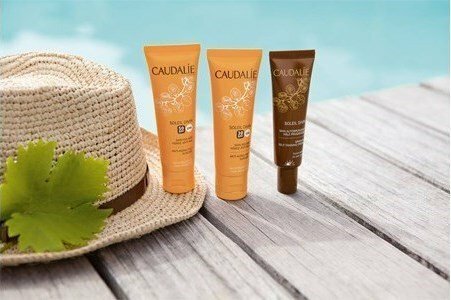 Solei Divin is the solar line of Caudalie that besides ensuring an excellent solar protection,it also has global anti-aging properties. A day, a week, a month? How long do you keep your New Year's Resolutions? Find how our skin looks when exposed to the UV rays. Ultra-violet light opens the windows to the soul of your skin!